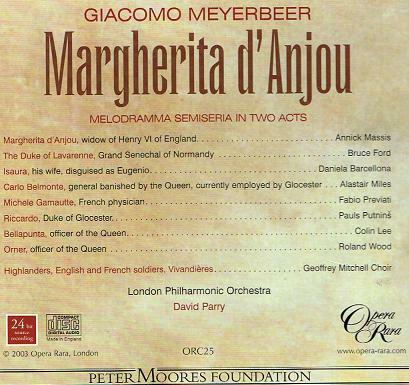 “MARGHERITA D’ANJOU is the fourth of Meyerbeer’s six Italian operas. Although he is often accused of imitating Rossini, this engaging opera shows how Meyerbeer uses the musical conventions of the time to forge his own musical style. With this score he challenged the orchestra of La Scala, one of the best in Italy, to its technical limits. New and exciting effects are heard in the orchestration of MARGHERITA D’ANJOU – ideas that would surface again in DINORAH, almost 40 years later. For this recording Opera Rara fields another extraordinary cast with the gifted soprano Annick Massis in the title role. Bruce Ford as Laverenne gives a remarkable performance and the young Italian mezzo-soprano, Daniela Barcellona, is exemplary in the role of Isaura. 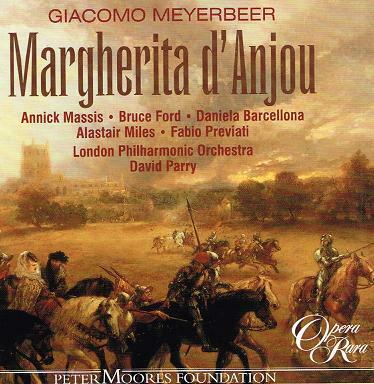 Alastair Miles (Carlo), Fabio Previati (Michele), and Pauls Putnins (Duke of Gloucester) are all basses par excellence. This highly entertaining opera, so easy on the ear, is helped by the performances of first-rate singers, the fine playing of the London Philharmonic Orchestra and the virtuoso conducting of David Parry. 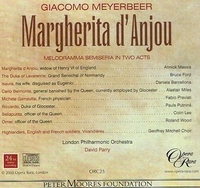 Booklet includes complete libretto with English translation."